Have you seen a Tegestologist lately? It’s quite likely that you have seen a tegestologist lately, but just don’t know it. A tegestologist is someone who collects beer coasters or beer mats. I am a tegestologist. I never meant to become one and until recently I didn’t know that I was. I thought there was no name for my affliction. Tegestology comes from the Latin word ”teg” which is a small reed mat. That’s where the name for my affliction originated. It turns out that tegestology is very popular throughout the world and particularly so in Germany and the U.K. which makes perfect sense. There is a thriving eBay community and social clubs built devoted to this hobby around the world. It’s actually a fantastic, unobtrusive habit which is historically based and is a nice way to preserve personal memories. There are some who take it much more seriously than that, using mat collections to chart historical and social changes throughout the years. It’s surprising how much you can learn about a time and place by looking at what they sell or endorse or depict on their beer coasters. Of course, there are proper ways to care for and store your coasters, all of which I have been breaking for years as I was ignorant of them. 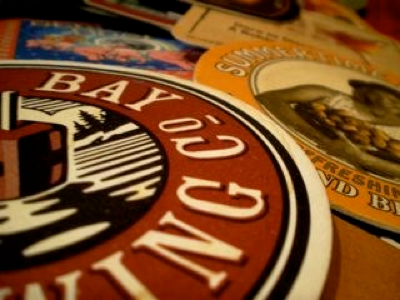 Beer coasters first appeared in Germany in the late 19th century and appearing in the U.K in the early 20th century. Wealthier patrons used tankards which had a hinged top to keep insects and other debris from falling into the drink. Less prosperous drinkers began to employ a small mat, first made of felt then later of pressed fiber and paper. Over time, the mats became employed under the glasses to absorb moisture. Today they’ve progressed to the point that there are mats which sense the weight of the drink they hold and signal the bar with a light when it’s time for a new drink. Seriously, there are. It was only a matter of time before advertisers began to view this as a means to reach a new audience and breweries began to employ the mats to their advantage. Guinness alone has over 1,000 different designs produced throughout the years. My personal journey into tegestology began on my first visit to Ireland. On the wild coast of Connemara in the town of Cleggan, I found myself spending an evening listening to local musicians and storytellers in Newman’s Bar long after the door had been locked and the closed sign posted. With the winds howling outside I hit it off with Jimmy Newman, the owner, and he told me of his plan to cover the ceiling (and walls?) with bar mats from around the world. I enlisted to help and for years I gathered the mats and prepared packages to send back to Jimmy. Over the years, the mailings decreased. I’m not even sure the bar is still there, although I’ll make a point of finding out on my next visit. However, my habit of picking up the mats never stopped. Today I have an impressive collection and a dram…I mean dream… of opening my own bar and somehow making use of all my tegestological specimens. Word is that the Guinness Book of World Record holder has over 150,000 of them. I can beat that. Someday. Next time you’re in a bar, make note of the beer coasters. They could be someone’s treasure.